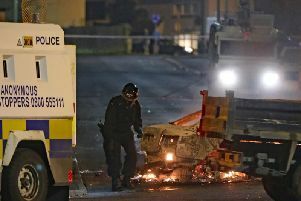 A loyalist paramiltary organisation’s application to be legalised has been deemed “invalid” by the UK government. In September last year a delegation representing the Red Hand Commando (RHC) travelled to the Home Office in London in an effort to have the group’s name removed from the list of proscribed organisations. At the time, a statement issued by the group echoed the words of former UVF leader Gusty Spence, “offering true and abject remorse to all the innocent victims of the conflict”. The initiative was supported by the Loyalist Communities Council (LCC) which was set up by Tony Blair’s former chief-of-staff Jonathan Powell to steer paramilitaries away from criminality. The delegation included LCC chairman David Campbell and former RHC prisoner Jim Wilson. Formed in 1972, the RHC eventually decommissioned its weapons in 2009. Yesterday, in response to a News Letter enquiry, a government spokeswoman confirmed the legalisation bid had failed. “An application for the de-proscription of the Red Hand Commando (RHC) was previously received by the Northern Ireland Office. The application was deemed invalid,” he said. Reacting to the news, TUV leader Jim Allister said: “It should come as no surprise that the proposal to legalise the Red Hand Commando was rejected. Mr Allister added: “This proposal was disgusting and an outrage to victims of all terrorist groups. If successful, the Red Hand Commandos would have created the template for legalising the IRA.